My fatigue vanished. A 4 year-old had just asked me a question. She didn’t just ask me a question, she asked a dynamite one. That in itself is not surprising, because children are naturally curious, until they keep hearing, “Be polite, don’t bother the man,” or “don’t know, go away.” She asked, because she wanted to know, and it’s a cinch her parents didn’t know. I think I understood why the Science Factory wanted planetarium volunteers who knew amateur astronomy. So, who named the stars? I bent down to her level, and said, “What a great question that is! !” Then I answered it: “The ancient Arabs, Greeks and Persians named the stars.” I didn’t get into the reasons they did: these people were desert dwellers, had no electricity, and light pollution occurred only with the Moon or a campfire. The nights were dark. Small wonder that they knew the sky well. The ancient Jews knew the Moon’s irregular phase cycle to within 2 minutes. The Saros cycle for eclipses, a repeat of a similar eclipse every 18 years and 10 or 11 1/3 days, was known 3000 years ago. “Mommy, I want to come back here in summer and learn more names of the stars.” I hope I am doing planetarium shows that day. I looked in the main room and saw an 18-month old girl trying to reach a door handle. She didn’t know what it was, but she saw it, and she wanted to figure it out. Kids run wild in that room. That is why the museum works. Kids need to look at how things recycle, how gravity works, how colors mix, where the lizard is in the terrarium, how we can make optical illusions, and what orbital velocity requires. When I ask at the outset of a talk whether anybody has questions, they are invariably from children. The questions are good. When I was a docent at Kitt Peak in 1986, a junior high school student asked me what a parsec was. Impressive. It is the distance of a star from us with parallax of a star one arc second. In other words, a star viewed six months apart in the Earth’s orbit appears to have moved, just like your thumb appears to jump when you close first one eye and then the other. The closest other star to the Sun is 1.3 parsecs. Great question. 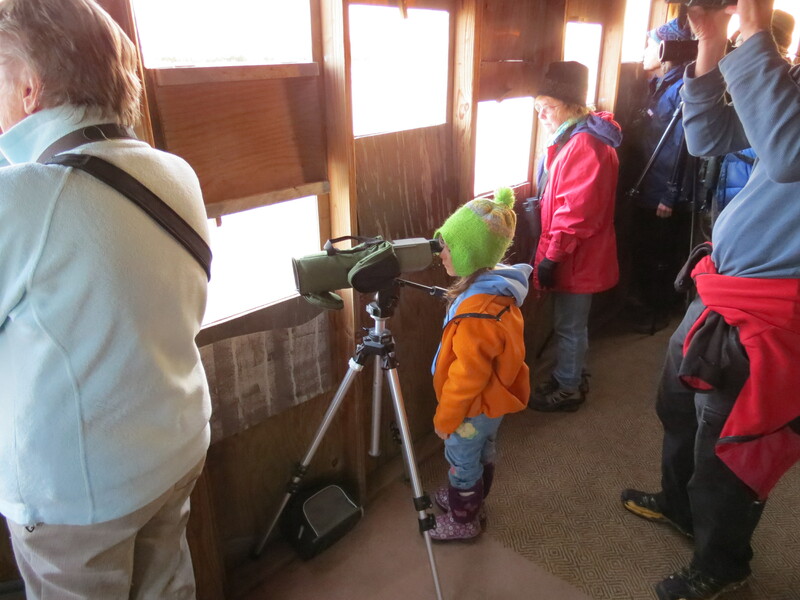 Young viewer of the Sandhill Crane migration, Kearney, Nebraska, 2012. Two great sights: the migration, and seeing a young person enthralled with nature. I was lucky. My curiosity was fostered by my parents. I listened to my brother ask so many questions at the dinner table that finally my father told him to ask only three. Great idea. Small wonder my brother became a superb grant writer. He learned to ask good questions; because grants are difficult to obtain, the better the question, the more likelihood of success. Precocity with some words is not always valued. Often, I don’t answer the questions but let the children find out by watching the show or doing an experiment. I’ve shown more than one child the Sun through a solar filter, and hear them say, “It looks like the Moon.” Yep, it does. That’s why we can have solar eclipses. I showed one girl Jupiter one night, and she asked about the dots near it. She had just discovered the Galilean Moons, as surely as Galileo had. The following day, I spoke about solar eclipses to OLLI, the Osher Lifelong Learning Institute. This was a tough audience of retirees. I figured I would get a couple of questions I didn’t know the answer, and I did. I also got mildly chastised by a man who did not understand the concept of protecting the eyes from sunlight during the partial phases of eclipses. To me, the concept is easy. He didn’t understand it until after I explained in great detail how the Sun’s rays damage the retina. He finally said, “OK, why didn’t you say that?” That’s a tough group. I also learned I didn’t explain the concept of eclipse families well, because several asked me at the break. I had the ephemeris and showed them the eclipses of 1997, 2015, and 2033. Then I showed them 1991, 2009, and 2027. They understood. Sure, there were one or two asleep while I talked, and a few looked bored, but that happens. When I took some out to view the Sun through filters, they were thrilled. Without my speaking, they saw a large sunspot and noted the Sun was the same apparent size as the Moon. I was concerned that I had gone through the material too quickly, but this group of adults has been lifelong learners for a reason, and that reason is curiosity. They were curious as kids, and they never stopped being kids. I opened the floor to questions, and I no longer had to worry about finishing too early. Great questions, too. The interesting thing about adults in these situations is that some drop the fears they have about asking questions, the embarrassment, the feeling they are being impolite, and revert to being a kid, asking questions when they don’t know. I love teaching in that situation. Some of the questions make me think, so I learn, too. I watch their eyes shine in a way that perhaps they haven’t shined for years, because for too long they felt it was impolite to question or were afraid it was dumb. Some took it to the next level by asking followup questions. Kids, of course, are naturals at doing this. The little girl got me thinking—I used to know the names of over 100 stars. I just went through the sky with my eyes closed and can still do 60. I’ve got work to do. That girl may be back, and I sure don’t want to disappoint her. If I can get everything in the Big Dipper and Pegasus-Andromeda right, the southern stars in Canis Major, and a few others, I’ll be ready. There is only one dumb question, asking one that was just answered when you weren’t listening. This entry was posted on March 28, 2015 at 20:16 and is filed under Uncategorized. You can follow any responses to this entry through the RSS 2.0 feed. You can leave a response, or trackback from your own site.